I went to the studio this afternoon because I needed to get the stepladder so I could use it tonight to hang my paintings at Starbucks. But it seemed a shame to go to the studio and not stay for a while. So I took an hour out of an already crazy day and worked on this project, the heart-shaped box that I am covering with collage and decoupage cut from printed metallic ribbons. I continued my work on the inside of the box for much of the time I had. But for the past week, I have been thinking about the design for the bottom of the box, so I used the last twenty minutes or so to try out my idea. I want to create a floral border around the edge that echos the floral design on the top of the box. 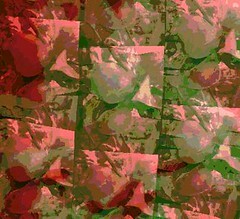 I am pasting pieces of printed roses, daisies, and leaves to create the design. (This part is decoupage rather than collage.) I only had time to create two small areas, but it was enough to decide that I will keep going with this idea. This photo shows the top of the box (completed) and the bottom of the box (just getting started). This is another photo from a recent walk at Long Hill Gardens. Right now, most of the foliage is still green. It is too early for fall colors, but there are lots of bright berries. 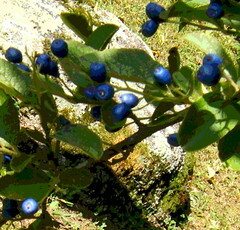 These are called sapphire berries. They are a really stunning blue, almost magical. Tonight I cropped the original photograph to get this composition. I also created a posterized version that I plan to post tomorrow night. This is a digital watercolor that I created today using my Painter program. The image comes from the idea that during the Jewish High Holidays, people pray to be signed and sealed into the Book of Life for the coming year. 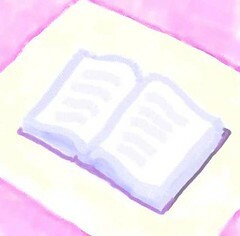 (After I finished this I realized that I had chosen colors of the sky at sunrise and sunset.) Yom Kippur starts at sundown, so today I am using this little image to wish friends and family the best of everything in the year ahead. This image began with a photo that I took during a recent walk at Long Hill here in Beverly, MA. 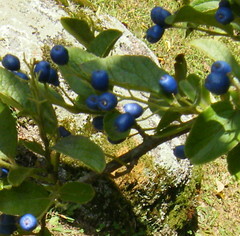 This time of year, you can see berries on lots of the trees and shrubs in the garden. 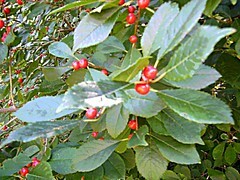 I liked these bright red berries, so I took a picture. I thought they might be honeysuckle, and a check on Google images confirmed this. (I remember bright red berries on the honeysuckle bush growing near the front porch when I was a kid.) Tonight I cropped the original photo to get this composition, and also used Painter to posterize it. 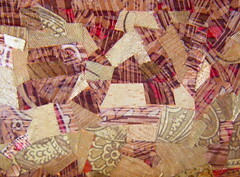 This is a closeup of my collage and decoupage project as it looked on September 23. 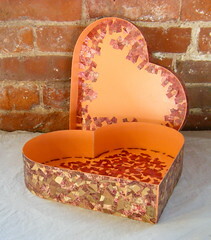 I am covering a heart-shaped box with bits of printed metallic ribbon. I cropped this view from a photo of the predominantly gold area around the outside of the box. Apart from a few small gaps, this part of the project is almost done. The closeup shows what I mean when I say this is collage. As I fit the pieces together, I am thinking about shape, pattern, and color. Thousands of tiny decisions go into making this work. But that is always true of art. And of life. This is another photo of my collage and decoupage project as it looked yesterday. 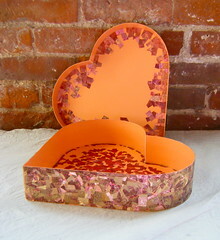 (I am covering this heart-shaped box with bits of printed metallic ribbon.) I am very close to done with the gold area around the perimeter of the box, close enough to see how this project is going when it is (finally) completed. I decided to take this photo of the box with the lid closed. It's great motivation for me to be able to what the final result is going to be. 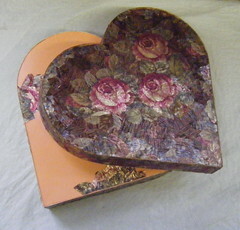 I went to the studio this morning to work on this project, a heart-shaped box that I am covering with collage and decoupage made from printed metallic ribbons. The box once was the container for a Mother's Day present. Today I concentrated on the predominantly red interior of the box. This area is slow going because I am looking for bits of intense red, and the pieces I am finding are very small. But I kept at it, and am seeing progress. As I worked on that, I came across some little bits of gold ribbon, which I used to fill in some of the gaps around the perimeter of the box (predominantly gold area). At this point, I am happy to announce that almost all the gaps in the gold area are filled in, and the only remaining gaps are extremely small, some of them so small that I plan to fill them with gold paint. I also did a little bit of work on the inside of the box top, which I am covering with a pink, fuscia, and orange print that "reads" as pink. I used Painter to create this posterized version of the photo I published here last night, a picture taken at the water's edge. The posterizing is subtle, but it emphasizes the shapes in the water, and adds a bit of color. Here is another photo that I took last Friday at Obear Park here in Beverly, MA. 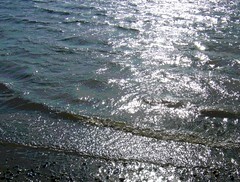 There is a small beach there, and I stood at the water's edge and took this picture. It almost looks black and white, but the photo is in color. Tonight I edited the image, cropping it to get this composition. I also created a posterized version which I plan to post here tomorrow. This image began with a photograph that I took on Friday, during an afternoon walk. We were exploring Obear Park, here in Beverly, MA, in the Ryal Side area. It was beautiful there, and it is fall, so dogs are allowed. Like Lynch Park, this is a waterfront park. There is even a beach, and you can watch boats go by, passing under a drawbridge and heading out to sea. It isn't clear if this is fresh or salt water. 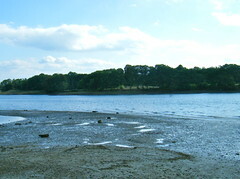 The sign says "Aunt Betty's Cove" and also says "Danvers River". In any case, if you look across the water, you can see Salem (the Kernwood Golf Course, to be precise). I liked the view, so I took some pictures. Tonight I chose the best of the photos and edited it in iPhoto to get this composition. To continue the Rosh Hoshana apple theme, here is another "digital print" made with my apple pattern (created from one of my photographs). To suggest the effect of a print, I used Painter's pattern pen with pastel. The original photo is of green apples, but I applied some color overlay in red. (I think these shapes read as apples more easily if they are red.) 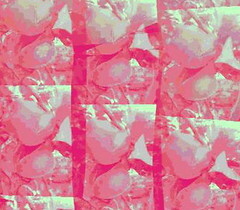 Then I posterized the result and cropped it to get this composition. 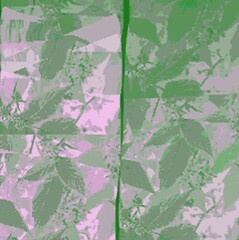 I used Painter to create this pattern, made from the posterized photo that I published here yesterday. I took the original picture back in 2005 at the Nashoba Valley Winery. I came across that photo yesterday when I was looking for images of apples for Rosh Hoshanah greetings. Back in 2005, I visited the Nashoba Valley Winery (in Bolton, MA). 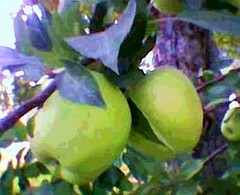 I took some pictures of apples growing in the orchard there, and published one of the photos here (August 14, 2005). Tonight I found the photo, and used Painter to posterized it and add some color overlay. The Jewish New Year starts in a few days, and I am planning to send this image along when I send New Years greetings to friends and family. I went to the studio early this morning to fit in a little time working on this project. 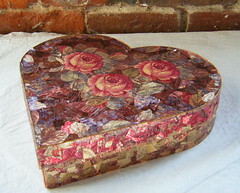 I am using collage and decoupage with printed metallic ribbons to cover this heart-shaped box. (The box once held a Mother's Day gift from my daughter.) Today I started with the inside surface of the box top, and also did a little bit on the red area inside the box. I also filled in a few gaps in the gold area around the outside. At first I was very aware of the time (because I didn't have much of it to spare); but soon I got very involved in what I was doing. The good news is that whenever that happens, it is wonderful, extremely calming, like a meditation. The bad news is that because I lost track of time, I didn't stop soon enough, and was running late. But it was worth it! Tonight I decided to do another digital image using Painter's pattern pen and the pattern that I created recently from one of my photos of raspberries. I am working out the idea of using the pattern pen to create a kind of digital print. On the surface, this image looks similar to the one I published here last night, but it is a little more complex, and I think it works a little better. Once I began to think about creating "digital prints" with the pattern pen, I decided to enlarge the size of pattern. Last night, I had to crop the final image to get the pattern to be large enough, but tonight I just enlarged the size of the digital brush as well as increased the scale of the pattern. I made the image with just three strokes with the pattern pen (although it took numerous tries to get the strokes where I wanted them.) Then I posterized the whole thing. I added some color overlay to a few leaves that needed a little help. Then I posterized again, and did a little cropping to get this image. I am happy with the way this image looks, but am even happier because I have figured out how to do this! 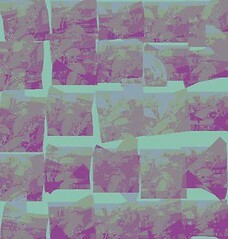 Tonight I used the "pattern pen" in my Painter program to create this digital image. As with the image that I posted yesterday, I used the raspberry pattern that I created recently from one of my photos. I have been thinking that the digital images I have been making with patterns resemble prints, and so I decided to push that idea a bit further. So tonight, I scaled the pattern for a larger image, and I also used a larger "brush." I worked with a pastel pattern pen over a green background. Then I posterized the entire image, and cropped it to get this composition. 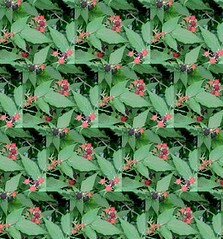 Tonight I remembered the pattern I created a few days ago from my photo of raspberries. So I decided to use that pattern with Painter's pattern pen. I used both the marker pen and the pastel pen. Then I posterized the image and cropped it to get this composition. 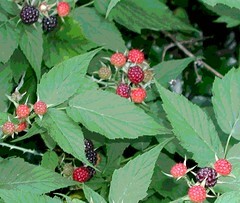 The shape of the raspberry leaves can be seen in the pattern, though not the berries themselves. But the pink and purple colors are drawn from the colors of raspberries, and (I just realized) that the pale green background is the same color as the stems of raspberry plants. This image started with a photograph that I took back in the summer 2006. I was on the train from Boston, heading to New York City to visit relatives. Today I used Painter to posterized the image, and add some color overlays to the sky. 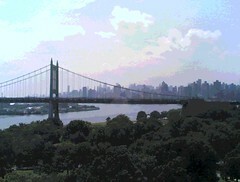 I like the image, but it is still hard to get used to the skyline without the Twin Towers. I have been thinking about memories of my hometown today, and looking through some old photos. 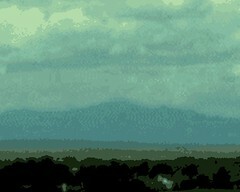 This image began as a snapshot of the front range that I took back in August of 2005, during a trip to Colorado. I stayed with my aunt, and that was always wonderful. One afternoon, we drove out to the college that overlooks the town, and I took some pictures of the mountains. Tonight I cropped this image out of one of those photos, and then used Painter to create this digital woodcut. Yesterday I drove into Boston for a doctor's appointment, but it turned out that I had the appointment time wrong and was an hour early. The weather was great, so I grabbed a snack and a coffee to go at a local Starbucks and used the time to take a walk. Just down the street, I came across what seemed to be a park at first glance, but it was really the quadrangle for the Harvard Medical School. It seemed very open and welcoming, so I decided to have my little picnic on a bench in the quad. Then I walked around the gravel path and enjoyed the beautiful lawn, the oak trees, and flowers. There are wonderful buildings on three sides of the quadrangle, and so of course I took some photographs. (Tonight I cropped this image from one of the best photos, then used Painter to posterize it and add some color overlay to the sky.) Well, we have all been thinking about health care, and so I thought this image would be a good image tonight, especially in view of President Obama's health care speech. Yesterday I got to thinking as I enjoyed my little excursion. I was struck by the words on the building, quietly marking the what is considered the best medical education in the world. I was also struck by the openness of the quad, a little park that anyone in Boston can enjoy. 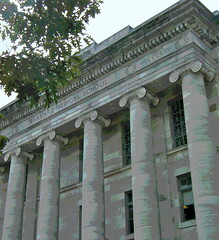 American ingenuity, know-how, and education created the Harvard Medical School; a generosity of spirit created that welcoming garden in the quad. And I was thinking that I hope we can find a way to combine the best of American medicine with the best of our compassionate democracy. . . . I made this image with a pattern that I created in Painter, using the posterized photo of raspberries that I published here yesterday. I am trying to replace some missing pattern files that I had created in Painter, among them a raspberry pattern. (The pattern files seem to have disappeared from Painter when I switched from a PC to a Mac.) I am pretty happy with this new raspberry pattern, and it just might be even better than the old one. This is the season for my an annual (and somewhat futile) effort to try to keep the raspberries under control. I do love the raspberries. The berries are so sweet and so beautiful! But the plants have very sharp thorns. Well, if you want the raspberries, you have to put up with the thorns, and I do. But they grow everywhere, even in places where you just can't leave thorns like that. So I have to trim them back, carefully, with regret, and with a camera close by. This image began with a photo that I took back in 2005. I came across it tonight because I was looking for photos that would make good patterns in Painter. Many of my pattern files seem to have disappeared when I moved from a PC to a Mac, and one of my ongoing projects is to create some more patterns to replace what I have lost. One of the patterns I liked best was from a photo of raspberries. When I saw my raspberry photos tonight, I decided to begin again. (It's the season for that.) So I cropped this composition out of the 2005 photo, and I used Painter's digital pastel to cover up a wilted leaf, and then posterized the image. 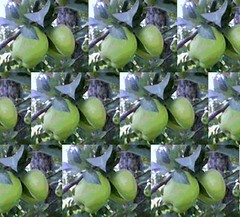 After that, I used this image to create a pattern, as will be seen in tomorrow's post. 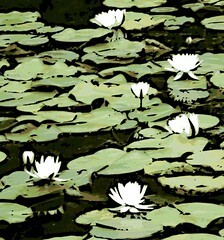 Yesterday I used my Painter program to posterize my photograph of waterlilies, taken during a recent walk at Bradley Palmer State Park. I also used Painter to create this digital woodcut of the same image. This image began as a photograph that I took a few days ago during a walk at Bradley Palmer State Park, here in Massachusetts. One of the main roads cuts through a marsh which is now full of waterlilies. I got as close as I could to take a picture, but I startled a frog who made a noise and splashed into the water. That startled me in turn, so I jumped, backed up, and decided to zoom in instead of hovering precariously on the edge of the pond. When I got home and opened the photo on the computer, I cropped a close-up out of one of the photos. But the focus was too soft to use as it was. 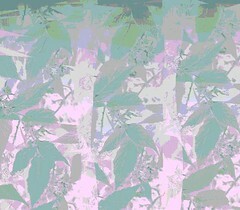 So I opened the image in Painter and used digital pastel to clean up some leaves and then posterized the image. I cropped it a second time to get the composition I wanted, and here it is. I also created a digital woodcut from this image, and I plan to post it tomorrow. I went to the studio this morning to take advantage of cooler temperatures and work on this collage and decoupage project. 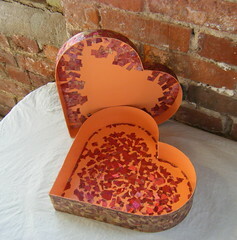 The heart-shaped box once held my daughter's Mother's Day gift. I saved the box and now I am covering it with collage and decoupage patterns cut from printed metallic ribbons that a friend was planning to discard. Today I worked on the interior red area, the hardest part to work on in hot weather because the pieces are so small and everything gets too sticky in the heat. I also filled in a few more of the gaps in the gold area around the outside of the box. Then I worked on the interior of the box top (pink, purple, and orange pattern). It is slow going, but I was thinking, as I worked, that lots of things worth doing in life have to be done slowly, putting pieces into place one by one. For the past few weeks, I have been admiring these flowering shrubs whenever I walk past them, which happens fairly often. I thought they were something we used to call "snow ball bushes" when I was growing up back in Colorado. 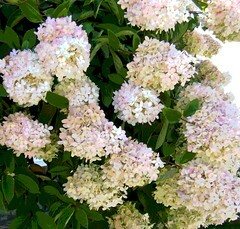 But recently the flowers started to turn pink, so I suspect they are a kind of hydrangea. I took some pictures of them yesterday. Tonight when I tried to crop the original photo, I realized that there was no good way to crop out the house that was in the background. (I try not to post pictures of private homes without permission.) So instead I opened the image in Painter and used some digital airbrush to cover up the house and create a plain background. Then I cropped the image, and here it is, just hydrangea. I also created a posterized version, which I plan to post tomorrow. This is a photograph that I took today during a walk at Long Hill Gardens, here in Beverly, MA. I saw some trumpet vines growing on what used to be the Sedgwick House. (This was once a private home but is now the main building at Long Hill, which is run by the Trustees of the Reservation.) I have always liked trumpet vines, so I decided to take some pictures. 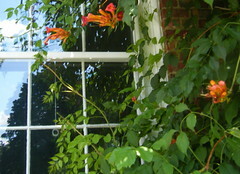 As I began to photograph the trumpet vines, I became interested in the play of the trumpet vines against the brick, the windows, and the reflections of the sky. Tonight I cropped this image out of the best of the photos.